To freshman Estefania Morales, golf is more than just a game. From playing golf with her dad while growing up in Venezuela, to competing as a golfer at Quinnipiac University, the sport has given her endless opportunities. It started off as a way to connect with her father. As a child, Morales had to choose between pursuing tennis or golf because tennis was changing her golf swing. She chose golf. “It was the only thing that I had close with my dad,” she said. Once she became older, it became a way for her to leave Venezuela and pursue an education in the U.S. When Morales was 14 years old, her parents dropped her off for a summer camp at IMG Academy, a private athletic training institute in Bradenton, Florida. She didn’t speak a word of English, and she didn’t know anyone at the academy. As an only child, Morales is very close with her parents—so leaving them for another country, even if only for a few weeks, was no easy decision. Yet the camp was a chance to learn some English and work on her golf game, and her father urged her to take the opportunity. Though it came as a surprise, she couldn’t help but say yes to the offer to go to school in the U.S. It is hard for Morales to be at a college in the U.S., knowing her parents are in the midst of the recent protests and political unrest in Venezuela. She also knows her father does not want to leave his home country. “It’s really hard because I want my parents to be here instead of being in the problem, and that’s never going to happen,” she said. She has limited time to visit home throughout the year, but she texts her parents every day and they FaceTime as much as they can. Quinnipiac golf’s head coach, John O’Connor, noticed it was hard for Morales to adjust to the college life when she came in the fall, but he knew how much it meant to her to be there and for her parents to let her leave home. “It leads me to believe that things where she’s from [in Venezuela] is very, very bad, very dangerous, and not a place that a parent wants their kid to grow up,” O’Connor said. Morales had to learn a new language, make new friends, learn a new style of golf and deal with vastly different weather in Connecticut than in Florida or Venezuela. The team at Quinnipiac was the perfect fit for her, she said—the right amount of work and fun. It has helped her open up, adjust to the college life, and enjoy it. He said Morales will bring this sincerity to whatever she chooses to do after her college golf days are over. As an economics major, Morales thinks someday she may end up back in Venezuela, and hopes she can make a change and help the people there. 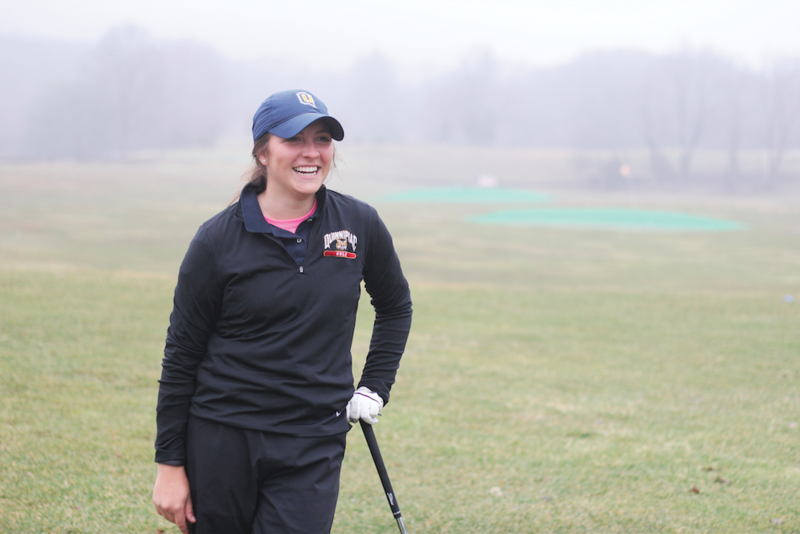 Though she appreciates where golf has gotten her, she said getting an education at Quinnipiac and figuring out what to do with that education is most important.